At last, bonus play in Conference USA starts tonight for the UTSA Roadrunners, as they prepare to host the Old Dominion Monarchs. Tip off is at 7 p.m. at the Convocation Center. Keaton Wallace leads the conference with 109 three-point baskets. – Photo by Joe Alexander. 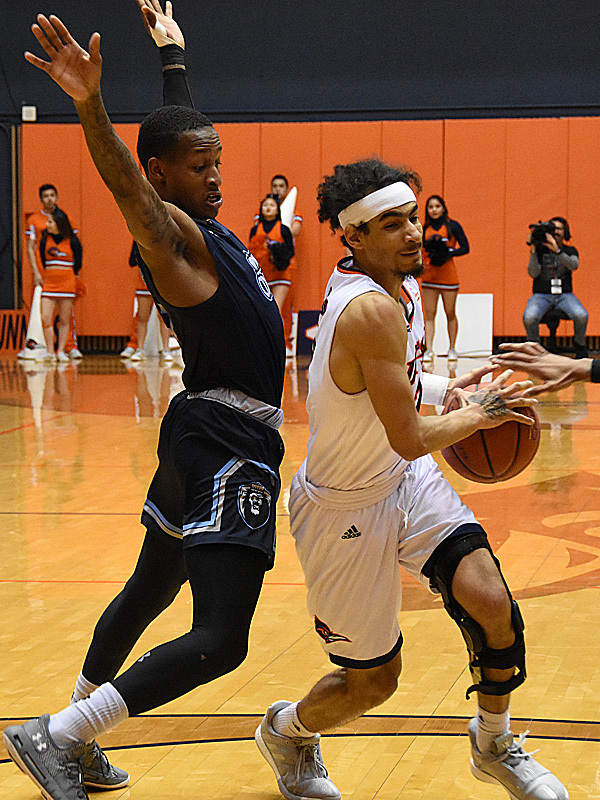 After an unusually long stretch of 11 days off, UTSA scoring whiz Jhivvan Jackson said he thinks the Roadrunners (15-12, 9-5) are ready to play the Monarchs (22-6, 12-3) and embark on a four-game stretch to complete the regular season. Old Dominion, Western Kentucky, Southern Miss, UTSA and UAB were first through fifth, respectively, after the first 14 games of the regular season. As such, they qualified for Group 1 of the bonus play format, which is designed to boost the conference’s postseason profile. The five teams are playing each other in a battle for the regular-season title. Also, the top four in Group 1 after bonus play qualify for a bye in the first round of the C-USA postseason tournament. After last weekend’s opening round, ODU holds a commanding lead in the standings, followed by UTSA and then Western Kentucky, Old Dominion and UAB, with the last three deadlocked at 9-6. UTSA hosts UAB on Sunday before embarking on a road swing to Western Kentucky and Southern Miss to close out the regular season. The UTSA-Old Dominion game has been discussed at length since the conference sorted out the Group 1 schedule on Feb. 13. 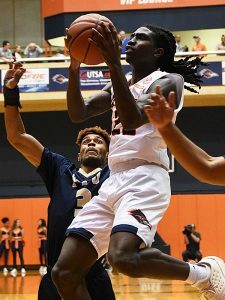 It’s a rematch of a Jan. 26 game in which UTSA executed a miracle comeback at the end to beat ODU, 74-73. In the first game, the Roadrunners erased an 18-point deficit in the final 4:43 to win by one. They hit seven three-pointers in a 25-6 run to the victory. Keaton Wallace nailed the go-ahead shot on a three from the corner — while falling out of bounds — with 15 seconds left. Old Dominion missed three shots on the final possession. “Incredible comeback,” Jackson said. “It started off by us being together, by staying together. Staying positive. The game features four players who are likely in contention for the C-USA’s Player of the Year award. Guard B.J. Stith and Ahmad Caver lead the Monarchs. Jackson and Wallace have paced the Roadrunners to four victories in which they have overcome double-digit deficits. This entry was posted in College basketball and tagged Jhivvan Jackson, Old Dominion Monarchs, UTSA Roadrunners by Jerry Briggs. Bookmark the permalink.